The new hinge and post toilet compartment redefines the structure of the typical bathroom partition system by eliminating the use of pilasters. Instead of building the enclosure on a framework of rectangular columns, this new style of bathroom partition is based upon a metal post and headrail frame. The small diameter, corrosion-resistant aluminum post removes much of the vertical visual bulk created by the pilasters that run from the top of the stall to the bottom in the traditional system. The headrail, constructed from heavy-duty extruded aluminum, provides the lateral support for the panels and doors. While the pilaster systems often incorporate headrails as well, the new hinge and post system features a more contemporary headrail design with an anti-grip feature that more effectively deters inappropriate or unwanted behavior in the bathroom environment. There are five basic components of the hinge and post toilet compartment: the posts, the concealed pivot hinges, the doors, the divider panels, and the anti-grip headrails are designed to function and fit together as a cohesive system, instead of the piecemeal, add-on approach so prominently featured in the pilaster-based solution. The new hinge and post toilet compartment redefines the structure of the typical bathroom partition system, eliminating the pilasters. This revolutionary new toilet compartment product delivers multitiered benefits to any bathroom design, including a high-privacy occupant experience, a cleaner and more contemporary aesthetic, and the many sustainability and durability advantages offered by the high-density polyethylene (HDPE) material from which the hinge and post system is constructed. This thoughtfully designed compartment structure employs many new features that now create a high-privacy occupant experience in a public bathroom stall. The combination of the innovative pivot hinge and angle-cut doors eliminates sightlines at the door completely, while multiple panel heights are available to discourage gawkers from catching a glimpse from both over and under the partition system. The innovative pivot hinge is such a departure from the hinges used in the typical toilet compartment system and so critical to the improved performance of the new system that it was incorporated into the name of the new compartment. One key difference between the hinges used previously and the hinges used in this new system is placement. In the hinge and post system, the pivot hinge is placed 6 to 8 inches from the edge of the door, instead of at the edge of the door. Located on the inside of the door, the pivot hinge is concealed from view to people standing outside the stall. Hinges used in pilaster systems jut out from one edge of the door to connect the door panel to the pilaster. They are highly visible and significantly contribute to the sightlines that exist when the bathroom doors are closed. 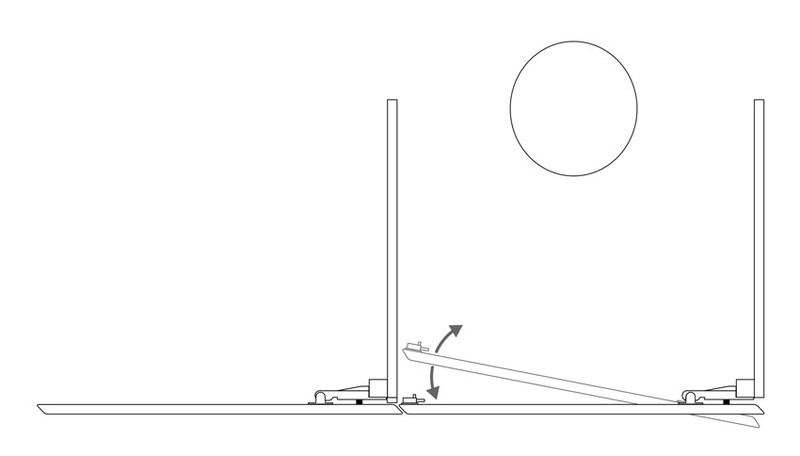 The concealed nature of the pivot hinge creates two important benefits: one aesthetic and one functional. From an aesthetic perspective, the pivot hinge is not visible from the outside of the stall, creating a cleaner look. Functionally, the concealed, out-of-the-way location makes it possible for the door panel to rest snugly against the adjacent fixed panels on either side, creating a sightline-free toilet enclosure. Beyond improved privacy, the lateral and vertical adjustment offered by these hinges makes it easier to align and level the doors in the hinge and post system. This flexibility simplifies the installation and maintenance of the system. The concealed pivot hinge is available in both inswing and outswing configurations of the hinge and post system to best accommodate the needs of any project. While the pilaster-based systems use straight-edged, rectangular columns and straight-edged, rectangular doors, creating a void and sightline between the two straight edges, the hinge and post system features angle-cut doors that eliminate sightlines into the stall when the doors are closed. A 60-degree angle is cut on two opposite edges of the door, allowing it to overlap with the adjacent fixed panels on either side of the door. This overlap eliminates sightlines and prevents inadvertent or roving eyes from seeing inside the occupied enclosure. The angle-cut door contains a 60-degree angle cut on two opposite edges of the door that will overlap with the adjacent fixed panels on either side of the door, eliminating the sightlines. 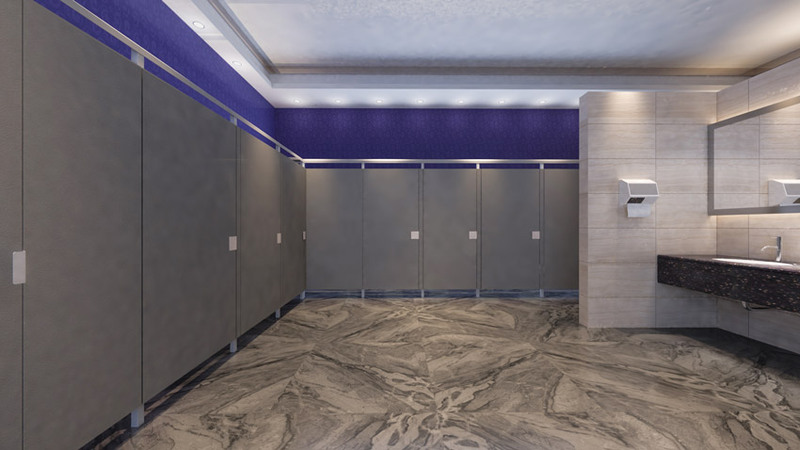 Another way to improve the privacy in a commercial, multi-stall restroom is to increase the height of the compartment door and divider panels. Taller panels can be mounted to reduce the open space that exists between the floor and the bottom of the panel and create a more formidable barrier to discourage people from reaching under or over the stall. The hinge and post toilet compartments are available in three panel heights. The standard panel is 55 inches high and is mounted 14 inches above the finished floor. The privacy panel is 62 inches tall and is mounted 8 to 14 inches above the finished floor. For a high-privacy application, choose the high-privacy panel with a height measuring 72 inches. These high-privacy panels are mounted 4 to 10 inches above the finished floor. The hinge and post system not only improves the functionality of the toilet compartment but also offers many distinct aesthetic advantages over the traditional pilaster system. The new system creates a cleaner, sleeker, and more modern bathroom solution. 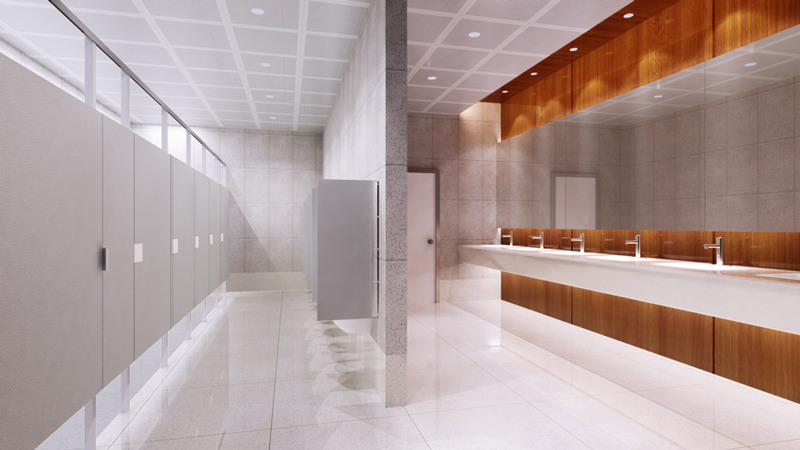 Extensive color and texture options provide designers with a broad palette for creating commercial bathrooms that will realize their unique vision for the project. Redefining the structure of the toilet compartment from pilasters to posts creates two important aesthetic benefits. Using a small-diameter, corrosion-resistant aluminum post instead of a bulky, rectangular column creates a bathroom partition with a sleeker and more modern aesthetic. The move away from the pilaster column structure also creates a solution that provides better balance, keeping the visual bulk of the panel where it is needed and streamlining the appearance of the support structure altogether. The hinge and post system offers many distinct aesthetic advantages over the traditional pilaster system, creating a cleaner, sleeker, and more modern bathroom solution. One of the greatest aesthetic advantages of selecting a hinge and post bathroom compartment is the concealed nature of the hardware. While pilaster-based systems rely heavily upon exposed and clunky hinges and brackets to make the toilet compartment operational, the hardware in the hinge and post system is not visible on the outside of the stalls. The hinges are concealed and the brackets are hidden for a cleaner look. There are more than 30 colors and textures to choose from, ensuring that there is a hinge and post bathroom partition system available to complement any interior decor. Available colors include a wide collection of classic neutrals, mosaic patterns, and metallic tints. Toilet compartment panels and doors can also be specified in several textures, including orange peel, hammered, rotary brushed, and more.